I wasn’t going to write a post for you today, but then I went over to Mama Kat’s and darn it! There were several writing prompts just begging me to answer! Remember when Little People really were little? And made out of wood? Now they are larger and completely made out of plastic, and they actually have names. When I bought Little People for my children, the toys were accompanied by short DVD’s introducing Sarah Lynn and Michael. Lily was so entranced by Michael making a rainbow that she adopted his name for several months. She would insist on being called “Michael” and wouldn’t answer to her own name. I even blogged about it. Reading that post from when Lily was four made me realize how much she has grown. As a third-grader, she is very well behaved in school and would be crushed if she needed to be in a time-out! So what does all this have to do with the writing prompt: 4. A childhood toy you once loved? After Christmas, I brought home some of my old toys from my Dad’s house. I didn’t think my daughters would have fun playing with them; they are getting too old for Little People. I set them out on the living room floor, and to my surprise, Emmy and Lily played with them all afternoon! I remember playing with the Fisher-Price castle with my little brother and sister, and even though I was a little old to be playing with Little People, I still thought the castle was pretty neat. What was one of your favorite toys as a child? Do your children play with them? I have little people toys for my children and didn’t realize until you pointed it out that the little people were wooden toys! Thanks for jogging my memory on this! I remember playing with the spirograph and i heard those are making a comeback! Kat recently posted…Paying For Houses Is Easy! I’m glad I inherited the castle. It brings back good memories! Little People are the best! My parents kept all of ours (a house, the city, the school…) and my daughter thinks they are the BEST! I remember playing with them all the time. So much fun! I would love to have the school! We didn’t have it when I was little. I loved the little people when I was a kid. The new ones don’t look quite right. I didn’t know they had names and a castle. We had the house, the school, and a parking garage with a ramp and a car elevator! Now that was fun! Everyone loves the car elevator! My girls had the newer version of the garage, and I just donated it to the preschool I work at. I’ll be glad to see it played with again! Love Little People! My parents still have some of the old Fisher Price toys my brother and I played with – a garage with toy cars, a toy phone, a chase register. My kids still love to play with them when we visit! My girls had the garage, too, and I just donated it to the preschool I work at. The old one broke, so they will have fun playing with it! I loved the original Little People. I always had one firmly clutched in each hand. In fact, it was when I was Des’ age and I might ask my parents to find my old ones to see if he takes to them too. I can just picture you as a little girl clutching those Little People! 🙂 Such a cute image! I remember combining my Little People sets with my Weeble Wobbles. This didn’t always work, but I spent hours playing with them. Weebles wobble but they don’t fall down! I forgot all about Weebles! We had some, too. Thanks for jogging my memory! My younger sister was a huge Little People person. I recognize the house. My mother kept it and all the grandchildren have played with it. Now that they are past Little People age, I guess it’s waiting for the great-grands. jamie@southmainmuse recently posted…Surrender. At the beach? I remember the wooden Little People! Too funny. My kids never really got into that. My oldest loved Thomas The Tank Engine. My youngest never really had a favorite. He would just play with his brother’s stuff. I loved stuffed animals when I was little. 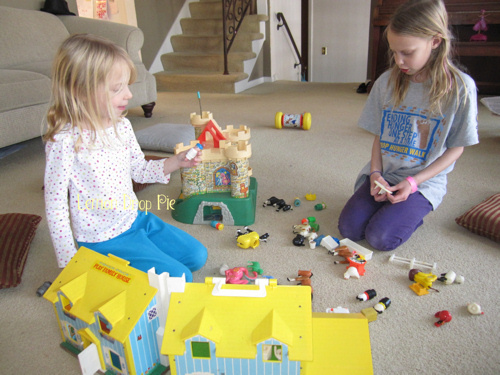 I loved the original Little People stuff – we had the house and the barn!! Of course, when my boys were little, I loved the new Little People stuff – we had lots of the fun toys and it was hours of entertainment! Kim recently posted…Do You Like to Know When Something Dreadful Is Coming up or be Surprised? I actually love the new Little People toys, too, and I can’t bear to give away the play sets I bought for my daughters! Totally forgot about Little People being wooden back then and will tell you my girls have the plastic ones and still love playing with them. For me, two of my favorites toys back when I was a kid was Barbie and Cabbage Patch Dolls (totally dating myself on that one for sure!). Funny my kids do not like the Little People, but love their books. Did you know the old Little People sets are worth some serious cash? The biggest money drawer is the Little People Farm Set. Yes, that’s one of the reasons I took my old Little People toys. My dad is finishing his basement, and we didn’t want him to just give them away!